Zachary Knight 'Zach' Galifianakis; born October 1, 1969) is an American stand-up comedian and actor known for his numerous film and television appearances including his own Comedy Central Presents special.While initially more of an 'underground' comedian, he garnered mainstream attention for his role in the comedy film The Hangover. 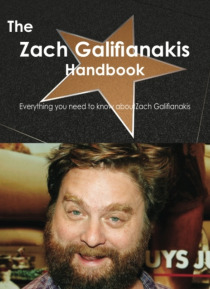 This book is your ultimate resource for Zach Galifianakis. Her… e you will find the most up-to-date information, photos, and much more. In easy to read chapters, with extensive references and links to get you to know all there is to know about his Early life, Career and Personal life right away. A quick look inside: Zach Galifianakis, Heartbreakers (2001 film), Corky Romano, Out Cold (2001 film), Late World with Zach, Below (film), Tru Calling, Dog Bites Man, Into the Wild (film), What Happens in Vegas, Visioneers, The Ballad of G.I. Joe, Gigantic (film), The Hangover, G-Force (film), Bored to Death, Up in the Air (film), Youth in Revolt (film), Dinner for Schmucks, It's Kind of a Funny Story (film), Due Date, The Hangover Part II, Puss in Boots (2011 film), Tim and Eric's Billion Dollar Movie, Dog Fight (film).